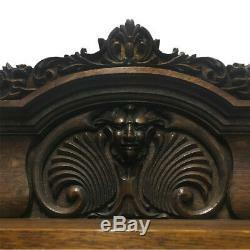 For those who enjoy heavily carved pieces, this one's for you! 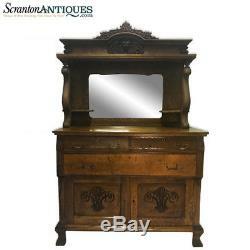 This Antique Carved Oak Mirrored Sideboard was obtained from an historical estate in Cherry Hill, New Jersey. 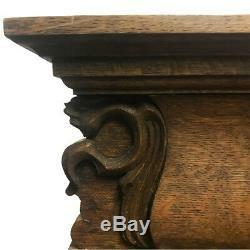 This Sideboard is hand crafted of solid oak. 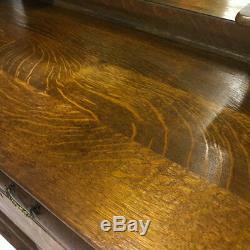 Many areas of this piece displays a stunning tiger oak grain. The most notable feature about this piece is the "Northwind God" face carved on the top. The face could appear to have goat-like horns off the sides of the head. 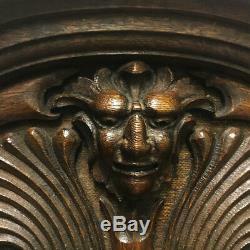 These carvings were commonly seen on many RJ Horner and Flint Furniture pieces during this era. This piece offers storage at its best; The top tier of the mirrored area is a large surface shelf along with 2 candle shelves on each side of the mirror. The chest area of this piece includes 2 side by side drawers which are embellished with aged brass keyholes and styled pulls. 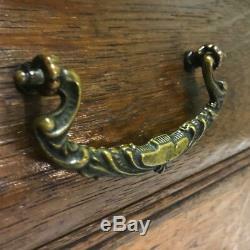 Beneath, is a large horizontal drawer which has different aged brass drawer pulls and 2 storage doors which have ornate carved fronts. 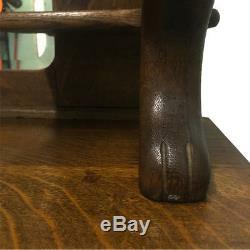 As the finish really seems to shine, we think this piece was refinished at some point in this pieces life. The mirror glass was replaced and is in flawless condition. All of the drawers open smooth and close nice. This is an antique piece and does have expected wear. Wear can include scratches, chips, blems and missing carved areas. The locks do not lock on each drawer and some keyhole faces are missing. Please see our high resolution photo gallery to get the best possible look at this piece. Dimensions : 48 wide x 76 tall x 23 deep / 38 inches from floor to chest surface. 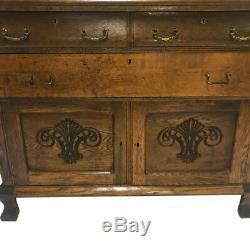 The item "Antique Gothic Carved Oak Northwind Sideboard Buffet Server RJ Horner Flint Era" is in sale since Wednesday, January 10, 2018. 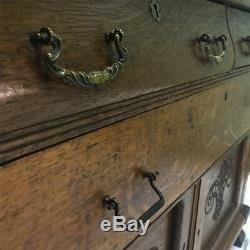 This item is in the category "Antiques\Furniture\Sideboards & Buffets\1900-1950". 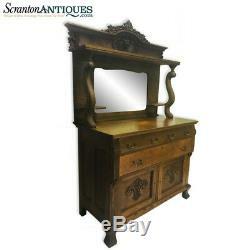 The seller is "scranton_antiques" and is located in Moscow, Pennsylvania. This item can be shipped to United States.